Two Purdue students have pioneered a new software business, SensorHound Innovations LLC, that transforms research into reality, making sensors more reliable. 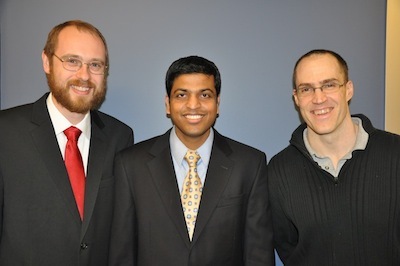 Mathew Tan Creti, PhD candidate in Electrical and Computer Engineering, and Vinai Sundaram, who earned his doctorate from the School of Electrical and Computer Engineering were awarded a six-month National Science Foundation SBIR phase 1 grant from Jan. 1 through June 30. Patrick Eugster, professor of computer science and co-founder of the business, has worked with the students in an advisory capacity from the innovation to the creation of their business endeavor. Eugster and Xiangyu Zhang, associate professor of computer science served as advisors for Sundaram’s PhD thesis. “Sensors are practically everywhere and in nearly everything in our physical environment, from kitchen appliances to health care devices, power meters, or industrial production plants. The specialized software tools have the potential to make sensors, their interaction, and our interaction with them more reliable and also reduce the cost for the manufacturers who integrate these,” said Eugster. Sundaram, the principal investigator of the grant, said that SensorHound has already developed laboratory-tested prototypes and will begin creating commercial prototypes of the flagship product. New features to their original research could translate into commercial versions by mid-2014. “One of the next big things in technology are Networks of Sensors (NoS) or the Internet of things (IoT) in which sensors like thermostat and CO2 level monitors are connected to the Internet. NoS have the potential to foster a smarter human society with unprecedented levels of automation in every walk of our lives, but are prone to software failures and security threats. SensorHound develops software solutions to improve the reliability and security of NoS," said Tan Creti. The future looks bright for the founders of SensorHound, who recently moved to the Research Park and purchased new equipment, but the founders are preparing for the challenges of launching a new business. "The main challenges during the initial stage include hiring employees and working with customers to customize a solution to meet their needs. We have hired a CS undergraduate student and plan to hire one or two more computer science or computer engineering students to help us with research and development. We also hired a Purdue student majoring in communications to help with marketing and public relations,” Sundaram added. SensorHound Innovations has received assistance from the Purdue Foundry, an entrepreneurial initiative managed by the Purdue Research Foundation. The Foundry provides Purdue innovators with resources to support the launch of new ventures, including assistance with business plans, prototype creation, funding, grant writing and mentoring.